Earlier this month, following my program in Washington, DC, Donald and Narin Jameson, old friends of mine, drove me to State College, Pennsylvania, where Penn State University has its main campus. It was overcast with a little rain and we passed the Gettysburg battlefield, a national historical park. The Civil War is one aspect of US history that I have been studying continuously, driven by my desire to better understand the current situation in Burma. John Brandon of the Asia Foundation was kind enough to give me an in-depth tour of the main Washington monuments in between the appointments, which we attended together. At the Potomac River, he said Confederate General Robert E. Lee’s lands had been just across the water. After the war, they had been taken over by the US government and part of it became Arlington National Cemetery. “The Confederacy had been just across the river from Washington,” he said. 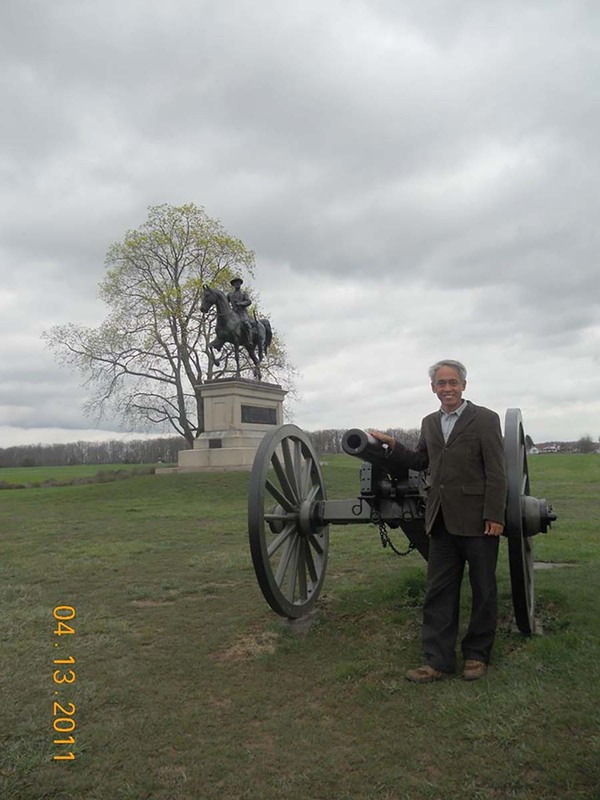 Again, at Gettysburg, north of Washington, Robert E. Lee had mounted an ambitious “left hook” and brought the war to the north, threatening Washington at the same time. The bold gamble may have led to the destruction of the Union Army and could have brought the US government to seek terms. The history of the US would have been different if the outcome at Gettysburg had been otherwise, hence why it is acknowledged as the most momentous battle of the war. There are monuments marking key battle positions like Round Top, and also commemorating the various state regiments and contingents. Fifty-one thousand soldiers had been killed, wounded or missing on both sides in just three days of fighting—July 1-3, 1863. My friend Don remarked that there had been no US Army as such at that time—only the state contingents. But there was a unified command, and later the commander General Ulysses S. Grant, became president. As we in Burma talk about the future of armed forces, there have been some references to the US Army at the time of the Civil War. In the same senseless way that the US fought the bloodiest war in its history, Burma has had a civil war stretching more than 70 years with no definite end in sight. Why do these wars have to be fought? Together with President Lincoln’s Gettysburg Address and the abolition of slavery, another reminder and lesson from the American Civil War is that it had been fought over secession. Without disregarding all the various issues that have been dissected, it is really hard to imagine how two American nations could have co-existed in harmony and peace. I am not attempting to draw straight parallels between the US of the 1860s and the Burma of today. At the same time, the insights here and there cannot be avoided, particularly for a country thrashing about in a search for a resolution. One big difference is the existence and magnitude of external powers’ involvement in the civil wars. Everyone is talking about peace and reconciliation. It is continually repeated that the issues in the conflict require political solutions and not military ones. How simple things would be if that were actually the case. But the sad reality is that the political and the military are intertwined, with an additional geostrategic angle, increasingly becoming all too apparent. And in all three overlapping approaches, Burma is still woefully inadequate. In Burma’s current ongoing peace process, just as there are many who repeat that the promises of the Panglong Agreement were not honored, there are equally those who had warned that the secession article should not have been included. In Burma’s return to a freer atmosphere, both sides have the right to speak their minds. The second session of the 21st Century Panglong peace conference ended on May 29. In its final two days, the contention and deadlock was over the non-secession commitment. The ethnic armed organizations (EAOs) assert that they had never considered secession and therefore this article is unnecessary and even offensive. The government side feels that they need this assurance, since there has been bitter experience over the matter in the past. I would say both sides have reason for their positions, and furthermore need to understand the other side better. This is a situation that is subtle, nuanced, delicate, and fraught at the same time. Is it so bad that there is no one in a responsible position who understands both sides? If you look closely, there are no ethnic nationality advisers whatsoever to the government and military leadership. One is forced to ask: did they bother to identify and appoint far-sighted and trusted advisers from the ethnic nationalities? People who understands the nuances and subtleties? And I don’t mean token appointments. The least the top leadership could have done is to seek people who do. One over-arching feature is the context in which federalism and secession are being discussed. Burma is a democracy now, and a multi-ethnic one at that. Decisions on the nation’s future cannot be made by a handful of leaders but have to be taken to the public. Yes, I do not deny that secession must be discussed, but the entire people of this country must make the final decision. Khin Zaw Win is the director of the Tampadipa Institute.